After the end of the political protests of 2011–2012, Russia has found itself in a troubled break between two eras. This is a time of conservatism, which, in its Russian incarnation, has morphed into a gloomy, almost medieval archaism. Shevtsova chaired the Russian Domestic Politics and Political Institutions Program at the Carnegie Moscow Center, dividing her time between Carnegie’s offices in Washington, DC, and Moscow. She had been with Carnegie since 1995. 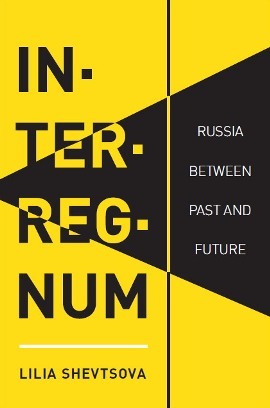 Lilia Shevtsova’s new book is a collection of essays about modern Russia and the processes that are related to it. After the end of the political protests of 2011–2012, Russia has found itself in the troubled time. This time can be described as “time out of time,” a break between two eras. One era has already ended, while the other has not yet begun. Living during this time is hard, and it is also hard to reflect on it and to find any signs of renewal. This is a time of conservatism; in its Russian incarnation that conservatism has morphed into a gloomy, almost medieval archaism. In her new book, Shevtsova gives the reader some sense of this time without a trajectory, describing the major trends of Russian reality, its hot-button issues, as well as the challenges Russian society is facing.